I honestly think that I might be a nicer human being if my youngest child would figure out how to adjust her internal clock. Those who have met me in the past seven and a half years since her birth has no idea who the real Kari is because I haven’t had a really good nights sleep since January of 2008. I am not saying this for the sake of a humorous blog post, my entire household can attest to the lack of sleep going on within it. Only one member of the family is completely oblivious to it. The one causing said lack of sleep. Our oldest and my husband as proof that we like our sleep around here. This was during the middle of the day. Her pediatrician once said, and I quote, “some kids just don’t need as much sleep as others”. And you would too if you haven’t had a really good night of sleep in eight solid years. ISN’T THERE SOMETHING WE CAN GIVE HER? Tried that years ago, nothing. My husband had to restrain me from jumping on him as he ran out the door. 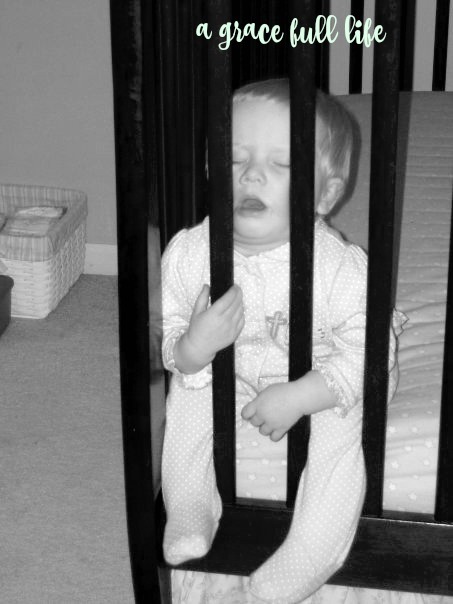 I went in to check on my youngest during a nap time and found her like this. This picture explains a lot. She was ALWAYS MOVING. Until she just wasn’t. Ellie has always had lots of energy and it just doesn’t turn off at night like a light switch. She has never been one to “pass out” in the car after a long day. When she has an exhausting day, instead of her falling asleep fast, she has always been the opposite. Taking her even longer to fall asleep on those days. Now that she is older, it is much easier, her being able to regulate herself to fall asleep by watching her Ipad shows (JUDGE AWAY) or reading her books until she falls asleep. I take pictures of her when she falls asleep in the car because it is like a Bigfoot sighting. Of course, this was taken in our garage because I had just gotten home and she had just fallen asleep five minutes before. Of course. But when she was a wee one, it was a carnival ride of epic proportions. 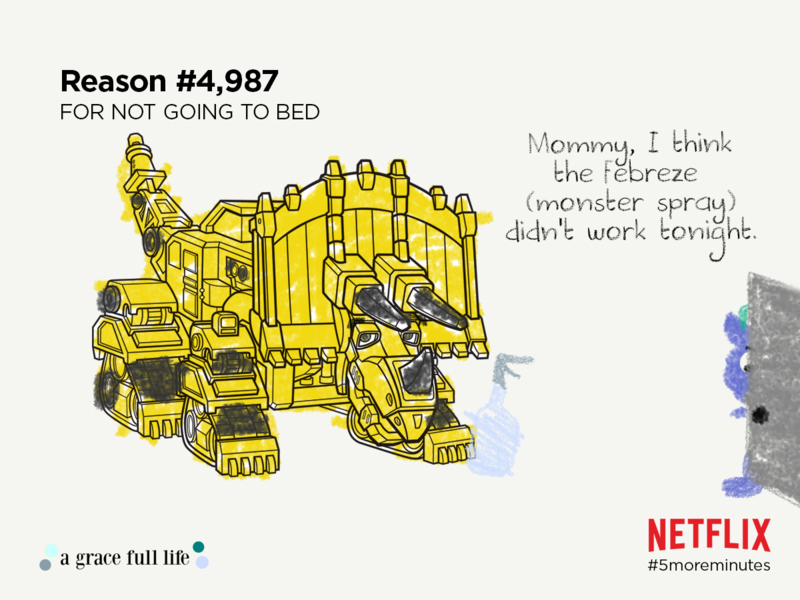 Lots of amazing excuses from our very creative child would start to come each night. Now I can appreciate them but back then, not so much. When you are going on no nap and 14 hours straight of NONSTOPENERGY, excuses shmuses, you start to become Samuel L. Jackson, if youknowhatImean. On the 11 hour ride home from my parents’ house. She only slept for 20 minutes of that trip. Here is the proof. We have had our share of bedtime nightmares over the years. Including literal monsters in which we had to get “monster spray” which was Febreeze in a plain spray bottle with the words MONSTER SPRAY written with a sharpie. I would tell Ella that the “monster spray” would make all the bad things go away each night. She was safe as long as I sprayed the room from top to bottom with the “monster spray”. Because I am SURE the Pioneers were spraying the crap out of the log cabin with fake spray to get their kids to sleep. WHAT HAS BECOME OF US??? It seemed to be working though, sleep was being had easier and I thought, HEH, THOSE PIONEERS WEREN’T AS SMART AS US. It was one evening as I was putting Ellie down and getting ready to whip out the magical Febreeze “monster spray” and douse her room like a mutha that she was extra nervous. But I assured her that the spray was getting rid of monsters left and right. It was all good, we had this. After four times back and forth to her room, I was standing at the foot of her bed when she said to me in her sweet voice, “Mommy, I don’t think the Febeeze worked tonight”. So much for the “monster spray”. 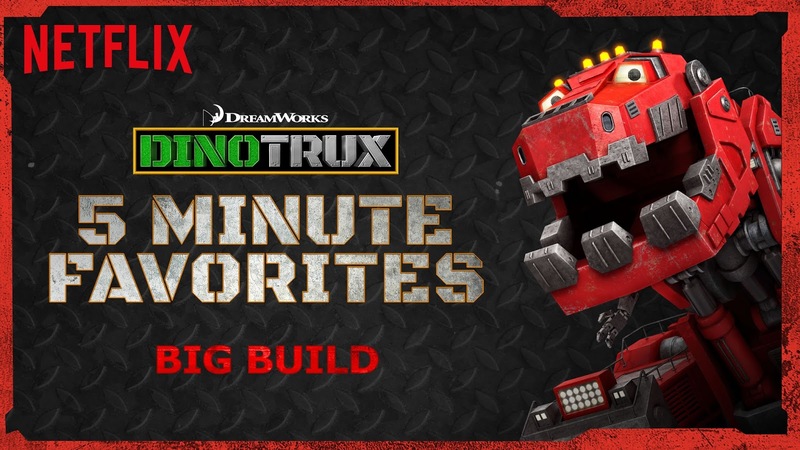 If you have kids that have trouble with those FIVE MORE MINUTES like we have had, Netflix has you covered with their Dinotrux 5 Minute Favorites. There are several different titles to choose from such as Big Build, Tortool’s Surprise, and Tarpit Rescue. So if your child is a bedtime staller like mine, put on a little 5 Minute Favorites and boom, time for bed. This is much better than having to pause midway through a show because we ALL know how painful that is. 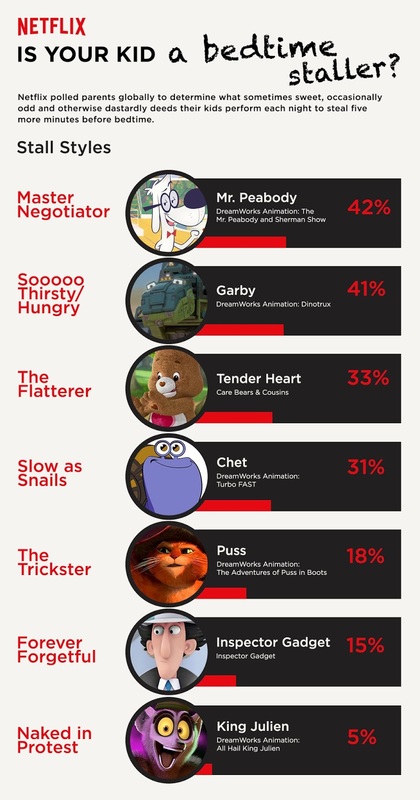 Umm, Netflix, my child is ALL OF THESE.